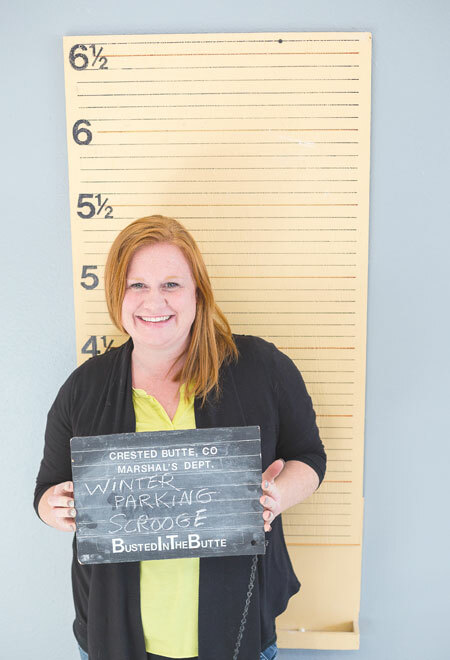 As you walk into the Crested Butte Marshal’s Office you’re immediately drawn to a large glass jar of peppermint patties and greeted by a broad smile beaming from office manager Kayce Barnett. It’s a friendly, non-intimidating atmosphere, keeping in tune with the Crested Butte flavor. Kayce is the first contact many people have when the need arises to seek out the law enforcement services. Examples: A young tourist comes in asking if anyone found his wallet since he now has no ID to get on the plane in three days. A local arrives with a wallet found in the snow, all cash and cards intact. A concerned couple, confused as to which side of the street they were supposed to park on, asks for clarification about why they received a ticket. Kayce answers questions for people who call in with everything from car accident reports to queries about fingerprinting. “It’s one extreme or another,” Kayce smiles. “It’s either nothing, calm and quiet, or it’s chaotic.” She greets them all with an effervescence that is probably uncommon in cities. “She’s our glue,” one marshal says of Kayce’s ability to hold everything together for the team. And she’s the author of what is definitely one of the most popular features in the Crested Butte News, Busted in the Butte, the weekly local police report. Her sense of humor keeps it in the comically entertaining Buttian style when appropriate, but emphasizes seriousness when needed. Kayce’s mom came to Crested Butte after a 1975 adventure with friends. Her mom loved it and stayed for a year, and later brought her family back to the area. Kayce was ten years old when she first visited and they returned two years later. “We always came in August and we would camp,” she says. “I never saw the winter and that was one of my fears when I was thinking about moving out here. I wasn’t raised in the snow or familiar with it. It’s not like you took driving classes to learn to drive in the snow in Ohio. School closed down a lot in Cincinnati for snow days, even if they got just a couple of inches—unlike here, where they don’t close for even a couple of feet. I had no inkling that I’d be moving out here one day, because from the time I was in my teens, I swore I was moving to the south,” for the small town feel. Kayce had never seen real mountains before. “We had the Smokey Mountains to visit but that was the extent of the mountains that I had seen until I came out here. I thought it was absolutely gorgeous,” she says. She was hooked after that. Kayce’s mom, Lew, had moved full-time to Crested Butte in 2003 and by 2012, Kayce was ready for a change altogether, in both career and a home. “Mom asked me to at least give it a try, live here for a year,” and Kayce discovered that she absolutely loved Crested Butte, winter and all. She landed a job at the Gunnison Sheriff’s Office as a detention officer and because it’s a smaller jail, that position came with many hats. As an animal advocate, Kayce has volunteered with the Gunnison Valley Animal Welfare League (GVAWL) since 2014. “It started out as fostering but I was so worried that one of my foster dogs was going to get adopted while I was out, as one of them did and I didn’t get to say goodbye,” she laments. So she started volunteering during adoption hours, opening and closing the shelter, completing the adoptions and accepting strays. And that’s how she met her boyfriend, Chris Steele. Chris was working for FedEx when he went to the shelter to meet one of their dogs. Kayce approved the adoption. Six months later she jokes that he adopted her as well. Kayce has scaled back her volunteerism to handle Facebook entries, updating the Adopt a Pet page and helping with announcements and postings. “I’m considered a foster but I’m a foster fail,” she grins, “because the dogs I fostered I actually wound up adopting.” Remi and Calvin are her foster fails and also Cooper, who was the top dog of 2017, which means he raised the most money for the shelter in a dollar-a-vote campaign. As an off-beat fun project, Kayce started the Gunnison Karma Rocks on Facebook, a nationwide project intended to spread joy and smiles through painted rocks left in random places for others to find and enjoy. When people find a rock, they can post it on the Facebook page she set up for Gunnison Karma Rocks. Some leave uplifting testimonials, stories of having a rough day only to find one of the rocks, which brightened their day. Kayce says the joy is reciprocal between rock painter and rock finder. The senior center has started painting rocks once a month to distribute and recently a Gunnison fifth grade class painted and hid rocks, sharing the photos of their project on Facebook. Most cities have their own page for their happy rocks, like Montrose Rocks. Kayce points out that the project is nationwide with cities and towns individualizing their own pages and rocks. “Tourists will find rocks here, take them home and hide them in their own town. You put the name of the group on the back of the rock so they’ll know what city it came from,” Kayce says. Finders then post it on that group’s Facebook page. Kayce is quite at home in the Gunnison Valley, and although she doesn’t ski, she enjoys the outdoors with her pooches. She’s also thrilled that for the first time since high school she’s near her family again, even though her mom is now a snowbird with longtime companion, favorite local bartender and former hotdog man Ted Fuhrmann, wintering in Florida for six months but returning for the summer and fall to Tincup.